A Southern Grace: the perfect food? Sometimes it's totally worth going the extra mile and making something from scratch. To me, carrot cake is one of those things--the mixes just can't touch a cake made from freshly-grated carrots, slathered with the perfect creamy frosting, and garnished with properly-toasted coconut. The Mamburger and I made this cake over the holiday weekend. She grated the carrots and I (happily) did the rest. That Mamster of mine, she knows how much I love to bake and is perfectly content to let me rip around the kitchen. Although recipes for carrot cake abound, I think this one may be the best I've eaten. It has pineapple and coconut, and it would've had walnuts if the ones on hand hadn't been shockingly rancid, despite being stored in the freezer. The frosting is cream cheese, of course, and to give the crunch that the walnuts would've provided, I sprinkled smothered the finished product with toasted coconut. -fats and sugars= I don't think I need to expand on those. Preheat oven to 350F. Grease and flour three 9-inch round cake pans. In a large bowl, beat together the sugar and oil. Add the eggs one at a time and mix well. Beat in the vanilla and pineapple. In a smaller bowl, stir together the flour, baking soda, baking powder, salt, and cinnamon. Add to the wet ingredients and beat just until moistened and smooth. Stir in the carrots and coconut. Divide evenly among the pans and bake for about 25-30 minutes, or until a toothpick comes out clean. 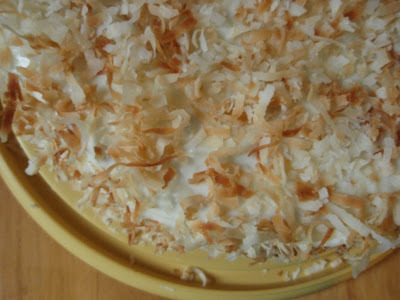 Allow the cakes to cool completely before frosting and decorating with the toasted coconut. To make the frosting, cream the butter, cream cheese, and vanilla until smooth. Add the powdered sugar a bit at a time and beat until creamy. Add the milk to obtain the proper consistency. I absolutely agree! A packet cake (and most bought cakes) can't beat a homemade cake. And I LOVE carrot cake!!! yum yum yum !! Is the pineapple very noticeable or does it just add a bit of moisture? OMG..it IS the perfect food! I love a good homemade carrot cake. And I agree boxed cake mixes just dont cut it! For a slice of that I would happily grate carrots and I hate grating. Smart move on the toasted coconut too because well everything is better with coconut. Yes! A carrot cake recipe with pineapple and walnuts is definitely a keeper :D And good job subbing the nuts for the coconut! It looks perfect to me. Love the coconut with carrot cake it is soooooo good! This looks amazing, Grace. I'd make it exactly as you did - no raisins! I do love walnuts in carrot cake, so that's the only thing I'd add. I agree that box mixes don't hold a candle to this! Totally worth the trouble! I love carrot cake, and this looks fabulous! Oh yeah, homemade carrot cake is such a treat! Your carrot cake looks so good, I can almost taste it! I've never had pineapple in carrot cake, but LOVE it! I want to make this...So, if you had it without the frosting, it might be a little more guilt free, right? Beautiful pictures! I've never had carrot cake with coconuts though...sounds like a nice addition. 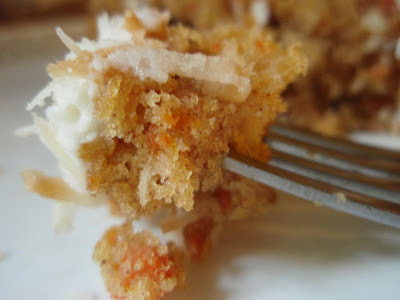 I want that for breakfast right now with my coffee... you gotta love tropical carrot cake! My step-son adores carrot cake - I make it only on his birthday because my recipe calls for TWO cups of oil - but boy is it moist! And no raisins or nuts for him either! I love love carrot cake, especially the frosting. I never knew pineapple was in there! mmmm absolutely scrumptious! Do you think Mamster would grate my carrots as well? That's certainly my least favorite part about baking carrot cake. I can understand the logic of a complete meal carrot cake very well! This sounds like the perfect cake with the addition of pineapple, and I love all that coconut and cream cheese frosting, of course! I like how you think Grace. I've yet to make my own carrot cake and to be honest can't remember the last time I had a slice. I do know that I AM estatic to see that your cake does NOT have raisins! I LOVE me some carrot cake. It is complete health food in my book. Yours looks fantastic. yum yum yum! this sounds very similar to the recipe i've used before. very very good. mmmmm...and what could be better than cream cheese frosting? not much i'd say! OMG - there aren't many things that (in my mind) will give chocolate a run for the money - but carrot cake is one of those things! YUMMMMMM!!! Hahahaha....I will now be happy eating just carrot cake for a meal. This just needs some chocolate chips or chunks and I'm in heaven! I've never added pineapple to mine... that sounds delicious! oh dear oh dear. Thank you. Simply...Thank you. This is exactly how I like my carrot cake. Pineapple, coconut, and walnuts (when available). Looks perfect! Baking with mom! Yay how fun :). I love the ingredients in your carrot cake. Ok, I'm gonna make this gf, for suuuure! Carrot cake is a fav of mine. Grace! You totally read my mind as I just made a carrot cake! They are so yummy but I am loving the addition of pineapple in yours. I love carrot cake, and yours looks incredible! Carrot cake is indeed perfect, and I wouldn't eat any except homemade. #8 kid has been begging me to make some, and it may be time. I am with you on Carrot Cake, there cannot be another perfect food such as this! It doesn't get much better than that! So classic. So tasty. So healthful. Just sharing what you've taught me with that last one. Carrot cake is one of my favs!!! Looks SOOO good! I agree that carrot cake is the perfect food! It is probably my favorite dessert. I only started appreciated coconut this year. And oh man, does this cake look sooo good! It looks perfect... lovely texture! I love a good carrot cake and this one looks like a winner! Nothing is more perfect than this You constantly outdo yourself!! As I am warming up to coconut lately I'd have to say this looks mighty fine! I wouldn't mind a slice or two with a scoop of ice cream for a nice summer supper. 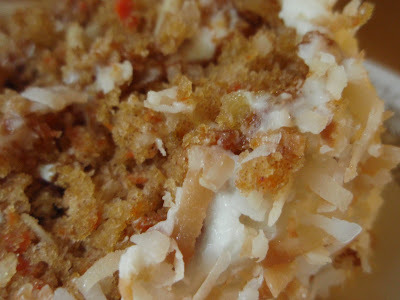 Carrot cake is my VERY favorite and I love toasted coconut on top. I always leave your site drooling Grace. Oh slam dunk delicious. Thought it was a hummingbird cake...pretty close, and very droolicious! Yes, somethings are just better made from scratch! Wait- no raisins! Yea no raisins! This looks like a keeper, great recipe Grace. For some reason I have never been able to get into carrot cake...the frosting, however...my mom would save me some, and I would eat it by itself...a good cream cheese frosting is heaven, pure heaven. haven't had a carrot cake with toasted coocnuts before! It looks wonderful! Mmmm, I'm glad you are also of the non-raisin carrot cake makers! This recipe does look really good. I tried another recipe that I was told was the best ever, and it tasted like a horse smells. Needless to say, I took one bite and threw it all away. It had some funky spices in it, and I'm pretty sure that's why it was so awful. I want to try this one. I'm generally in love with all things coconut. for me it's always worth it going the extra mile and making things from scratch! This carrot cake looks exquisite! I don't think I have ever made a packet cake in my life. Nothing is better than a homemade cake and they are not all that involved to make, are they? Your carrot/coconut cake looks wonderful and I adore cream cheese frosting. The cake looks moist and delicious. Going to make this when my daughter comes down next week. I've never been very big on coconut in general, but I continue to surprise myself lately w/ my newfound love of "toasted" coconut. Good stuff, that toasted coconut. Carrot cake w/ cream cheese icing, however, is an alltime fave. No nuts I say! WOW that cake looks absolutely delicious! I am always looking for a good cc recipe! I have to try this one! Your cake looks wonderful. I have always made the carrot cake from the Silver Palette Cookbook and it has pineapple in it too. Will have to give this a try. I love carrot cake and your recipe sounds and looks so yummie! I'll definitely try it! Lovely pictures. It is the perfect meal and my hubby's favorite cake. This is one of my favorite cake. Looks amazing. This makes perfectly good sense to me! What a nice well rounded meal! Beautiful pictures. I love carrot cake and any other traditionally savory ingredient that's creatively used for a dessert/sweet. Oh man I so agree carrot cake from a box? Obscene! THis one that you and the Momburger cooked up looks incredibly moist, delicious and of course nutritious. What a great looking carrot cake! We are sooooo on the same wave length Grace, your cake is gorgeous! I've always felt that pizza was the perfect food. Maybe pizza for dinner and carrot cake for dessert, just to be sure? Carrot cake is a favorite around here...and it's certainly my favorite way to eat veggies. Carrot cake is my fave... as much as I like chocolate... carrot cake still holds the number one spot... yes yes the perfect food! My mom and I baked together this week as well. Fun. :) This looks great-I love carrot cake. And it is always better homemade, although it is also just about the only cake I will eat out as well. Who wouldn't fall for carrot cake? I love carrot cake--haven't had it in ages though. And, adding pineapple is a nice addition. makes me think I should make some soon. BTW thanks for stopping by. I LOVE carrot cake (we had it at our wedding!) and yours look absolutely fantastic! My mouth is watering! Amen to every word of this post! I adore carrot cake :) I usually get lazy and buy the pre-shredded carrots to make mine. Now I challenge you to try this recipe and see which one you like better! Oh great, now I have this amazing craving for carrot cake! And yeah, this one would be a great place to start! Especially with the coconut. Too good! I love that all of the food groups are represented, too! Yes, yes, YES! Carrot cake is so good, and I like that you include crushed pineapple in your recipe. That and walnuts are my two must-have add-ins. And, of course, amazing cream cheese frosting. Man, I have got to make this. carrot cake is my favourite, and i'm loving the sound of this recipe. This combination, carrot, pineapple and coconut ... it's like a vacation in your mouth! Love this! Starred! Giz (for some reason), bought a bunch of coconut flakes at the bulk store last time she visited. They're now sitting in my cupboard. This looks like a good way to use them up. Personally, I would trade raisins for the walnuts.